If your feet are on the larger side, it can often be tricky to find stylish shoes that fit well. But that needn’t mean you miss out on cute footwear! 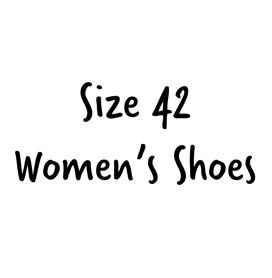 Fortunately, we’ve got a great range of women’s shoes available in a European size 42. You’re sure to find plenty to choose from here, whatever you’re looking for! The styles you see here use European sizing, and these are the shoes that are available in a women’s size 42. This is equivalent to a ladies size 8 in the UK. You can see more information about US, UK and European shoe sizes on our Women’s Size Guide, where there is a handy conversion chart! Whatever the occasion, and whatever your style, you’ll find the shoes for you here. 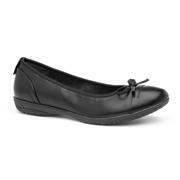 For shopping trips or running errands, try our stylish ladies canvas shoes. They’re perfect for pairing with some skinny jeans and a cute top for everyday wear. Or try our pretty ballerina pumps, which look just as good worn with skinny jeans at the weekend as they do with a pencil skirt for the office. Speaking of the office, we’ve got plenty of smart court shoes, including some with wedges for extra support and comfort. Or why not grab a pair of our funky women’s trainers? They’re just the thing for hitting the gym, heading out for a jog or for those busy days when you’re always on your feet. You’ll also see some of your favourite footwear brands here in our ladies’ size 42 shoes range, including SPROX, Tamaris, Heavenly Feet and Soft Lines. Like all our shoes, our size 42 women’s shoes come at fabulously low prices, and if you order online, you’ll get free UK delivery. Alternatively, why not click and collect from your nearest store? 31 products from £14.99 to £39.99.